Have you tried Easy Joiner, our digital tool that that allows you to recruit new members in mere minutes, as long as you’ve got a phone, tablet or even laptop to hand? It’s even easier than you might think – we rolled it out during our Grovember campaign and now have an updated version 2.0 following your feedback. So if you’ve not tried it, check it out now! If you’re talking to colleagues about joining the union, or visiting another office, and you don’t have any application forms on you, then Easy Joiner could be just the thing for you. Register your email address. We’ll email you straight away with a link. Click the link in the email we sent you and start recruiting – it’s that simple to get started. Now, click begin recruiting and hand your phone or tablet to the person who is joining, so they can put in their name and email address. Congratulations! 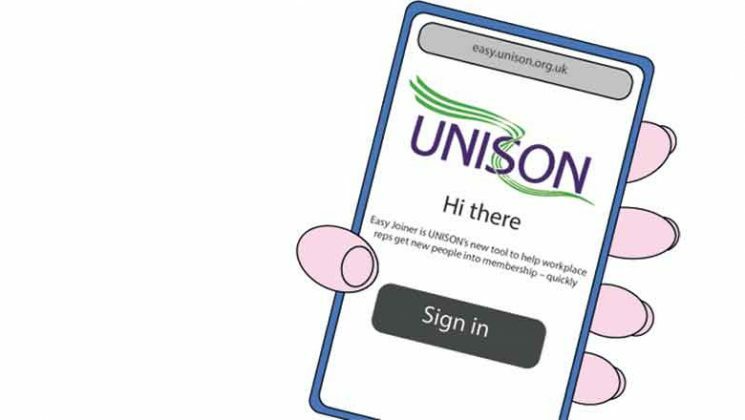 You have just recruited your first UNISON member using Easy Joiner. It really is as simple as that. The potential member will immediately receive a link to join online, with their information already filled in. And now you’ve asked one person, why not ask someone else?